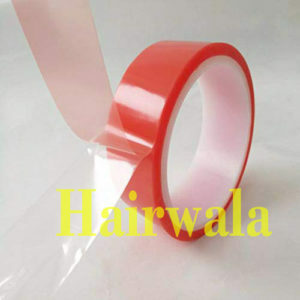 Cotton double sided tape has ultra strong super hold glue, helping to create the shape you want and to confidently perfect to your style, make sure that the skin is clean, dry & no from any cream or Moisturizers before applying. Cut the required amount from the roll and stick to the skin. When you know where you would like the patch to sit, remove the backing paper and press the hair patch firmly in place for a few seconds. Do not use on damaged or irritated skin. Its almost 5x adhesive power then foam base wig tape. If you use glue with it, you can get wig holding time. Without glue holding time 1-15 days. 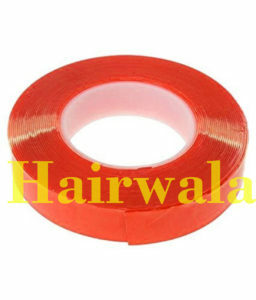 Get the ultimate hold with the Double Sided Hair Fixing Red Tape For Hair Wigs For Men. It’s a transparent clear tape that’s water resistant with a strong hold. The tape fully extends to a good length of 50 meters with a hold time of 1-2 weeks. 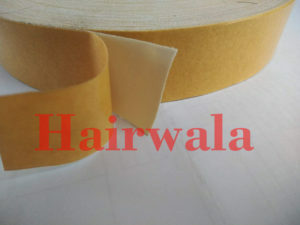 The tape does not leave any residue behind, and is very durable for daily use for filament and superior filament users. **Note: All Tape Holding Time are Vary From Person to Person and Body Chemistry, And we are not giving any assurance about holding time. 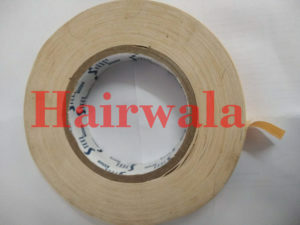 If you want to buy Tape, please Contact Us On +91 9586661024.